This is what global warming does to you. 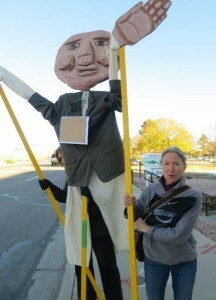 Just kidding, it’s a leftist’s puppet brought to a protest. Yesterday, fractivists from all over the country walked to Colorado barefoot to protest fossil fuels. Just kidding. They hopped on planes and drove in cars to show up here to protest the very fossil fuels that delivered their a$$e$ to Colorado. The group showed up to protest the leasing of 90,000 acres of public lands in the Pawnee National Grasslands from the Bureau of Land Management. The protest was orchestrated by 350.org, Center for Biological Diversity, Food and Water Watch, Rainforest Action Network and other big money enviro groups. It’s just too bad that these enviro groups are such science deniers.